You may have had Japanese steamed red bean buns, mochi, or ice cream? These sweet treats are delicious! However, when I had the opportunity to try Bob’s Red Mill Adzuki Beans, I immediately decided on going in a savory direction… We love beans at Andersen casa, but for whatever reason, adzuki beans were never on the radar. They are definitely more difficult to find than black, pinto, and navy, but they are available. The adzuki bean is actually an annual (as opposed to perennial) vine, that is widely grown throughout Asia. They are highly nutritious. One cup of cooked adzuki beans contains 294 calories, and provides 17 grams of protein, 57 grams of carbohydrates, .2 grams of fat, and 16.8 grams of fiber. That’s more protein than the beloved kidney bean, making them an excellent choice for vegetarians! They are high in iron, antioxidants, and many other important nutrients. Wouldn’t you say it’s time to add them to your repertoire? I have cooked with both stovetop and electric pressure cookers for 40 years. I’m not one to “jump on the bandwagon” with the latest trends, and I’m certainly not one to spend more money on the brand that has the best marketing campaign. All that to say, I have a Pressure Cooker XL and a Tramontina stovetop model. They are both 6 quart models, and both get the job done. So why is “Instant Pot” in the title? It’s complicated. I want people to find my recipes. People are searching for “Instant Pot Recipes.” Rest assured, I will provide instructions that will work in whatever brand cooker you have. You might even do it the old-fashioned way… in a pot on the stove! Please keep in mind this is not an “authentic” Japanese soup. It’s “Japanese inspired,” meaning I’ve used my knowledge of Japanese flavors to create a unique, eclectic dish. I keep tamari, sesame oil, ginger, garlic, and miso in my well-stocked pantry. I prefer to use my Roasted Mushroom Stock in Instant Pot Adzuki Bean Soup, but I try to keep mushroom broth on the shelf as well. Kale and butternut squash are readily available year-round in the Rio Grande Valley. If you’re short on time, many markets carry cubed butternut squash and chopped kale. I simply put the beans on to cook, then prep the rest of the ingredients. Adzuki beans cook more quickly than many beans I cook regularly – 15 minutes in the pressure cooker! Lastly, I love garnishes, and you will find them on this soup. 😀 Scallions, white or black sesame seeds, dried seaweed strips, thin-sliced red chiles are all great choices. Make it your own! Leftovers are great warmed up the next day! Remember: Check the “natural foods” section of your market (or try a natural foods market like Sprouts or Whole Foods) when looking for adzuki beans. I know I can count on the quality of their products. You may also find adzuki beans at an Asian market, but I’m not sure that I’ve ever seen them dried… Ready to give them a whirl? 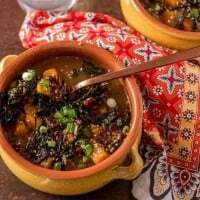 Savory umami flavor in a hearty, healthy, comforting vegan and gluten free Japanese-inspired soup... It's ready in 45 minutes or less with the help of a pressure cooker! Add adzuki beans and water to your IP/PC. Cook the beans under pressure 15 minutes. You may have a "manual" button or a "beans" button. Make sure to set it for 15 minutes. At the end of the 15 minutes, allow the appliance to sit 10 minutes before opening the valve. If using a stovetop pressure cooker, the same applies. Bring the pot to high pressure, reduce the heat, and allow the beans to cook 15 minutes. Turn off the heat, and let them set 10 minutes prior to opening the valve. While the beans cook, gather the other ingredients, and do any prep (don't forget the garnishes! When the cooker is de-pressurized, rinse and drain the beans, and wipe the cooker dry. Set the IP/PC to meat/stew or beans to saute/brown. It really doesn't matter which setting as the pot will remain on the setting unless the lid is locked in place. Add both oils and the ginger and garlic. Stir fry until very fragrant being careful to not brown it. Add the hot broth and kombu (if using). Add the tamari (or soy sauce), squash, and kale. Whisk the miso into about a cup of the broth, then add it in to the soup. Add the cooked adzuki beans back into the pot. Simmer the soup until the veggies are tender. (Time varies). To serve: Ladle into bowls, and sprinkle with your choice of garnishes. Enjoy! As I mention in the post, I make my own Roasted Mushroom Stock. When I don't have any, I use Pacific Foods Organic Mushroom Broth. It's very flavorful. Starting with the broth means the IP/PC doesn't have to get it hot thus saving quite a bit of time! Drop the kombu in with the broth to start the flavor infusion (if using). Not all miso is gluten free. Check the label. I typically keep shiro (white) miso in my refrigerator, and that is what I have used here. The darker miso is used with meats (IMHO). I am reluctant to use or suggest specific settings for the IP/pressure cooker mostly due to the fact that there are many brands and many settings. Additionally, different beans need different amounts of time, and the appliance doesn't know what kind of bean you're cooking. Older IPs have a "manual" setting, and newer ones have a "pressure cook" setting. My Pressure Cooker XL has a "beans" setting that can be adjusted. I do adzuki beans for 15 minutes, with a quick natural release (10 minutes and then release pressure). I'm happy with that texture and firmness. This is a good article on IP buttons from my friend Barbara at Pressure Cooking Today. Macronutrients (approximation from MyFitnessPal.com): 265 calories; 16 g protein; 7 g fat; 36 g carbohydrates. Does not include garnishes. Why can’t I find the recipe on this page? Is your website broken? Hi Jasper! I apologize! I have been dealing with some technical issues today, and I turned off the recipe card plugin while trying to figure it out. I'me still having some problems but working to have it up ASAP. I hope you'll come back! Hi. Your recipe doesn't tell when to add the cooked beans. Do you add them and simmer them with the veggies? Thanks. Hi there! I apologize! The recipe was a little unclear. I'm heading over to address it right now. The cooked beans are added in and simmered with the veggies. I'd have responded sooner, but I was en route from Peru back home! Cooking this for the first time and excited to try! However, I’m confused by the second part of the recipe and wanting slightly more specific directions on how long to cook/simmer the whole stew. Also, just left it on sauté setting on IP and hoping that’s right! Would have loved to do 5 minutes of pressure but don’t want to kill the miso goodness. I'm so sorry! It's Easter, and I just returned home! As per step #1 - the beans need to cook under pressure for 15 minutes. After it sits 10 minutes, release the pressure. You then drain the adzuki beans and proceed with the recipe. You don't cook the stew under pressure. You just simmer until everything is tender. I hope this helps and got to you in time! Please let me know! Thanks for the prompt reply! On a holiday no less! I could not figure out how to simmer in an IP so I ended up sautéing with the lid on, oops! It came up to pressure so I definitely did it wrong but it still tasted great. I was having trouble getting the squash soft. In the end it worked out and was tasty with a scoop of brown rice. Loved the flavor combos! I'm so glad you enjoyed it! Thanks for taking the time to let me know how it turned out! I have been experimenting with different Indian beans and picked up some red chori at my local Indian grocery for no particular reason. When I looked them up, they are the same as adzuki beans. So check out your local Indian grocer. You will be amazed at how many different beans and lentils they have. The Bob’s Red Mill website has a recipe for chori. Awesome! I had no idea... Thank you Suzi! We have friends who travel out west to get those beans. They swear by them and they convinced us to buy some. And we agree they are good. I'm going to save your recipe to try with them. The colors of the soup are so deep, it almost warms me up through the screen. Just beautiful. I'm always looking for tasty instant pot recipes and this sounds amazing! I hope you'll give it a try Stacey! That had been my experience as well Lois! I really love the texture of adzuki beans, and I'm hoping this recipe encourages people to try them in more savory dishes! Wanted an InstaPot for Christmas, but didn't get one. Maybe for my birthday but this recipe looks so delish. I have never even heard of these types of beans before. Can't wait to try it. We just got an instant pot recently! Will have to add this to the list! Warm and comforting soups are my absolute favorite. I've never made anything with miso before, but would love to try. This looks like the PERFECT winter recipe!! And I've never heard of adzuki beans...I'm going to have to experiment because my house LOVES beans! What a great new recipe find! Thanks for posting this! Thanks Amanda, and yay for beans! We do love beans (all varieties) at our house as well... I hope you give adzuki beans a whirl! I'm one of those weird people where beans are my favorite food. If I see a bean highlighted as a feature ingredient, it will almost ALWAYS make it into my menu plan. I love Bob's Red Mill products and will be looking for their adzuki beans next time I'm at the store! I really need to get an Instant Pot! This looks perfect for the snowy day we are having today! It's definitely a great soup for a cold day! 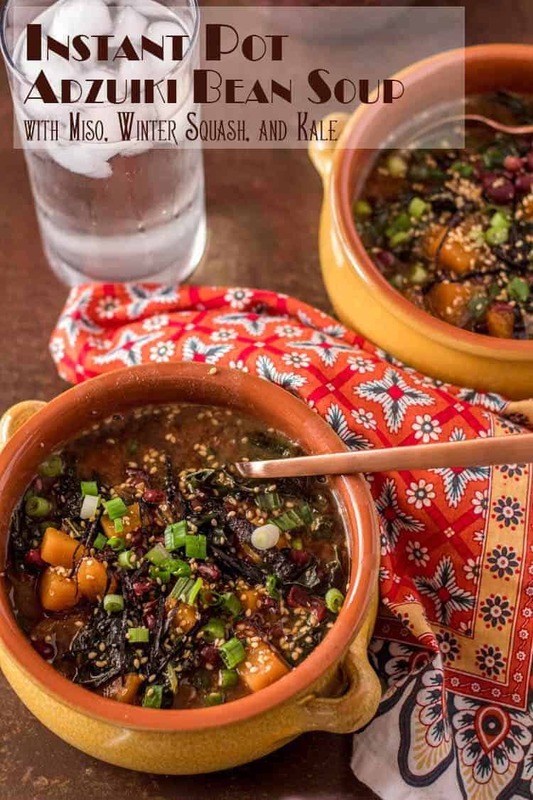 i have never cooked with adzuki beans before but i love the idea of miso in this soup. sounds so comforting! Miso broth is comforting, and works really well with the adzuki beans! The colors in this dish are gorgeous! You can just see the umami. I don't have an Instant Pot....but I do have a pressure cooker and slow cooker. Homemade soup is the best. Perfect for this cold weather we are having. Great to make a huge pot for leftovers too. 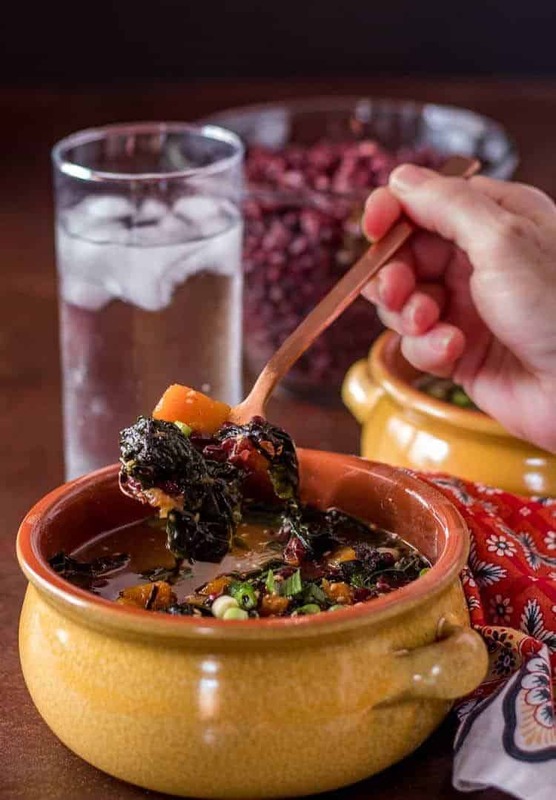 This vegetarian soup looks and sounds very healthy and delicious! Thanks so much! It really is tasty, and full of nutritious ingredients! Adzuki beans: they're not just for dessert any more. This is a really tasty dish. I loved it. Well, we love red bean ice cream and mochi, and red bean buns, but this savory recipe really is surprisingly tasty!